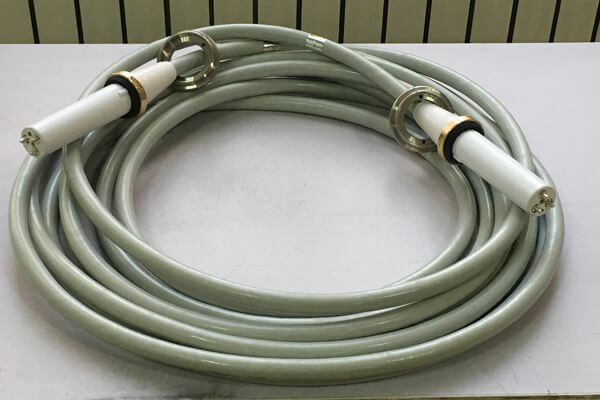 Medical 90KV high voltage cable is an important part of X-ray machine.The high voltage part of the X-ray machine mainly refers to the three components of high voltage cable, high pressure oil tank and ball tube. In many cases, X-ray machine failure, the first check is the high-pressure part. High-voltage fault repair refers to the maintenance of these three components. The high-voltage part of the line is not complex, complex is the process, and the high-voltage components are sealed is not convenient to directly open the test, after opening the packaging needs special equipment. High voltage fault performance, different machine fault performance is not the same, the following phenomenon will be considered is the fault of the high voltage cable part. First of all, the high – voltage cable itself breakdown, often occurs in the high – voltage cable repeated bending. Second, the high – voltage plug breakdown.Third, the cable core wire open, occurs in the cable core wire and high voltage plug welding. The reason for its failure is that the high voltage of the machine fault exceeds the withstand voltage of the cable.Production quality, cable core line to see more than a production quality problems. Because the ball tube moves repeatedly to drive the high-voltage cable end to bend repeatedly when the machine is used, the performance at the bend becomes worse. The properties of insulating materials. Newheek medical 90KV high voltage cable can provide you with fault detection service.One is offline detection, with insulation tester (meter) measurement of insulation resistance, with a multimeter test lead on and off.Second, substitution test, with a pair of new cable substitution test. Our medical 90KV high voltage cable can meet your different requirements.